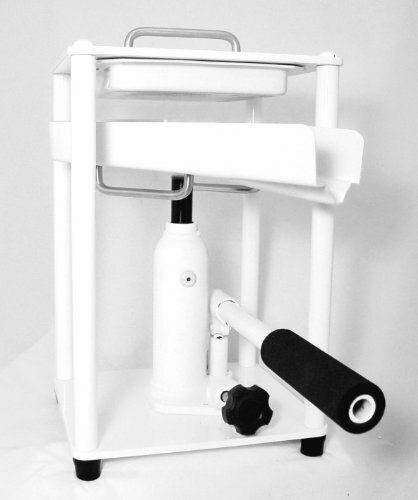 The Welles Juice Press is also known as Peoples Juice Press is a classic juicing machine. It’s a manual juicer which uses 2 tons of hydraulic pressure to extract every ounce of juice from fruits and vegetables. I’ve already reviewed over 60 juicers, and this is the only one that doesn’t use electricity. If you’re planning to live off the grid, this juice maker is a perfect choice. Your strength is all you need to operate this machine, and I guess that’s a win-win situation. You get to move your muscles and at the same time, you get to drink the fruit of your labor. At first, I thought that you can put whole produce in this juice extractor but it turns out to be impossible. The tray which catches the juice is made of plastic. Jacking up a whole apple might cause it to break. You still have to chop your fruits and veggies and place it inside a cloth. It’s like a handkerchief that you’ll have to fold into a flattened square or rectangular shape to secure the produce. The amount of produce is also critical. You need to put just enough amount of fruits and veggies that would be covered by the pressing plate to avoid spills. If you’re juicing in large batches, you can stack up to three pressing cloths. There are two complimentary pressing cloth included and you also have an option to get a pressing bag. This bag can speed things up however you might need to buy more of this cloth if you plan to juice regularly. This machine is pretty straightforward, but it’s not like a self-feeding electric juicer where you can just put all the fruits and vegetables down the chute and wait for the magic to happen. Common sense is all it takes to operate this if you’ve used a jack before, the mechanism is just the same. The first step is to chop your produce into fine chunks that would even out perfectly when placed inside the pressing bag or juicing cloth. Once you get the juicing bag flat and perfectly aligned with the pressing plate all you have to do is to jack it up until all the juice has drained or until you’ve reached the maximum amount of pressure you can apply. That’s pretty much it. You’ll need a separate juice jug though to catch all the juices, it doesn’t come with a free juice jug. For an added stability there’s a top handle that you can hold on when applying pressure and the base is also equipped with a rubber stopper. When you release the pressure though don’t expect the drip tray to go down automatically, you’ll have to pull it down manually. This is a major concern among users. Newer models come with a handle below the drip tray. I’ve also seen a user over at youtube.com who installed a spring on the drip tray and the base of the frame to pull it back automatically when releasing the pressure. That’s pretty ingenious but not of us have the time and skill to improvise. This is the great part about this juicer. It doesn’t have many parts to clean up after every usage. All you have to do is wipe it clean with a moist cloth, a paper towel or a sponge. According to the manual, you can use a 50/50 solution of water and white vinegar to clean the press thoroughly. You can also use a 50/50 bleach and water mixture to sterilize the press, just don’t forget to rinse it afterward to remove any residual bleach. The drip tray isn’t dishwasher safe, so please don’t put it in the dishwasher. Regarding the pressing cloth, it can be used multiple times when maintained properly. Once you’ve rinsed it thoroughly, put it in a Ziploc plastic bag and store it in the freezer. This will keep it clean and free from any microorganism. Do not boil or air dry it as it could make the cloth brittle. After 3-4 uses you can wash it with biodegradable soap. Thaw it under your faucet then rinse it with filtered water before using it again. The quality of the juice it produces is comparable to twin gear juicers, in fact, it can produce the driest pulp in conjunction with a masticating juicer or when you grate your produce first. Compared to traditional electric juicers it doesn’t have revolutions which translates to the lowest level of oxidation. It slowly squeezes the juice out of the pulp for maximum nutrient retention possible in a juicer. This juice press is pretty much limited to hard produce and citrus fruits. Leafy greens and soft fruits (excluding berries) won’t go well with this machine. Hard produce includes fennel, pear, watermelon, ginger, sweet potato, asparagus, cucumber, apple, pineapple, pumpkin, yakon, beets, celery, carrots, turmeric, cauliflower, bitter gourd, cilantro, broccoli, garlic, coconut, and pepper. Citrus fruits include orange, tangerine, mandarin, lime, lemon, and grapefruit. Warranty 1 Year Limited Warranty on Hydraulic Jack. This machine isn’t cheap and you could purchase a great juicer at its price point. If you’re considering to purchase a Norwalk Juicer, Welles Press is a great alternative. They are both hydraulic presses but Welles is four times cheaper. There’s no question about the juice quality but the number of fruits and veggies you can juice with this machine is pretty limited. And I’m not sure why I would settle for something that is difficult to operate when there are better options at the same price or even lower price. Well, I guess if you support a cause on saving mother earth this Welles Press can decrease your greenhouse emission footprint since it doesn’t need electricity.